The Julie/Julia Project has a publishing date and is up on Amazon (but not yet for pre-order). September? Darn. If you want to read instead in blog form, here it is. I've written about stockmaking before, but have never shown pictures of the process of turning the second stock (remouage) into glace. The other weekend I realized that I was completely out of stock in my freezer. This is unusual for me to let the supplies get that low. I think that a winter of soup making proably did me in before I could realize it. I never make a beef stock without doing a second stock and glace afterwards. Since I use oxtails for my meat base, even the first stock isn't cheap. Oxtails are around $3/lb on average. 1 pound of meat per 1 pound of water means around 8 pounds of oxtail per gallon (since they are so flavorful, I go with anywhere from .5 to .75 per pound of water). But, you are getting two products for the price of one, so I feel it is worth it. 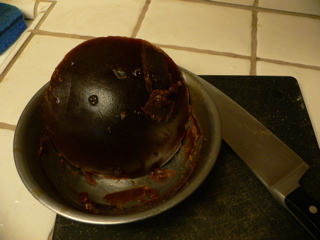 In addition, oxtails are full of the gelatin that makes glace what it is. The second stock is very pale in color. It's almost straw colored or light brown, much like beef soup you'd find from a can. But as you will see below, the end product turns out much different. I didn't take any pictures of the starting process. 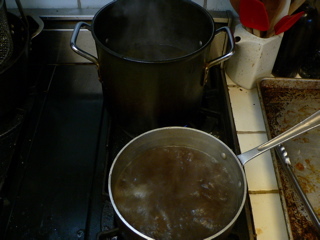 But that 6 quart stockpot in the back was full of the strained second stock. 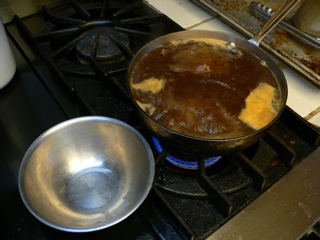 After reducing the stock at a medium simmer and skimming it as it reduced, I transfered part of the contents to the smaller 3 quart in the front. I tried to moderate the heat to avoid a rolling boil, but let's face it; this is a long process and a slow simmer is only going to make it even worse. 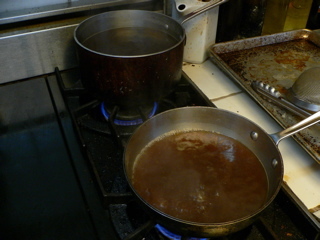 Once the 6 quart pot is empty, I continued to reduce the liquid using the 3 quart (now at the back of the stove). 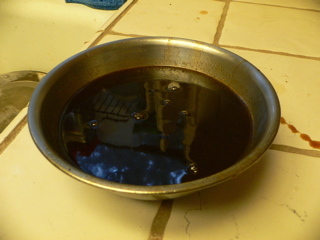 As that began to boil down, another transfer was done into a 2 quart. Each time I tranfered, I did so through a fine mesh strainer. I used a 2 quart here as the final pot because of the initial amount of liquid and the fact that I used oxtails. In the past, for smaller amounts or weaker stock, I've gone down to 1 quart or even a 2 cup pot. The reduction continues. Here's the 2 quart undergoing the final stages. Note the bowl that is my final target amount. At this point, it's important to be a bit careful with the heat as the liquid is starting to thicken and can stick and burn if you aren't careful. I have once fallen asleep on the couch while doing this and ruined the glace. When to stop? When the stock is very thick and the bubbles quite large. You can see how syrup-like the reduction is by the drips on the counter. The first few times you do this, you'll probably reduce more than you need. If you don't reduce enough, you will know because the glace does not set up in the fridge. If this happens, simply re-heat and reduce some more. Except for burning, the process is pretty forgiving. Place the bowl into the fridge and let it set up. This goes pretty quickly because of the small amount of liquid and the massive gelatin load within it. 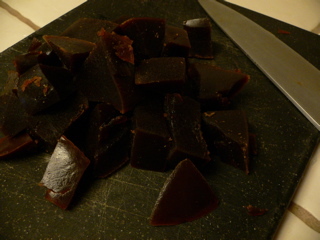 Once it is hard enough to slice (a few hours or overnight), run a thin knife around the edge and pry up to unmold. This is another indicator if you have reduced enough. If the spheroid tears easily rather than prys up, you may have not reduced enough. 8 inch chefs knife for scale. The bowl holds just over two cups of liquid if filled directly to the rim. After all of that work, the sliced cubes are ready for the freezer. Kept sealed well in a zip-top bag or other container, they will last for longer than you probably need. Once you start making use of these in sauces, you will likely use them up before they could go bad. Glace is a labor of love. You have hours to make the first stock (at least one hour in the oven browning the meat plus anywhere from 6-12 simmering the first stock). Then more hours to make the second (another 6-12); although overnight in a low (200-225) oven does make that a bit easier. Then the straining. And the reducing. And the skimming. And then cleaning all of these pots laden in grease and sticky beef residue. And all this time your entire house is humid and smells of cooking beef (a wonderful perfume during the first hour; less so after a day or more). But, now you have condensed flavor and time and frozen it for later use. The sauces you make will be sublime. Even better, they form themselves quickly and will apparently no effort. 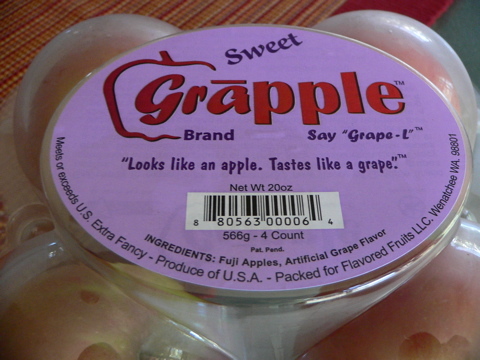 A coworker told me about this new "fruit" called a "Grapple" which they speculated was a hybrid. As you can see from the above label (which I did not read prior to purchase, eating, or disliking) it is actually a "normal" apple that has been treated with some kind of artificial flavoring. I assume this is in the form of a gas. I'll admit that the package and the fruits themselves certainly smell like grapes; however only in that ideal, chemically, floride treatment sense of the word. But, I was willing to give it a go, as I assumed that this was due to some sort of interesting hybrid activity -- there's been lots of that going around in the fruit world these days. I only saw "artificially flavored" when looking at the images I'd snapped. Hey, who checks labels for flavorings on a whole piece of fruit! Me, I guess from now on. Unfortunately, smell was all these had going for them. The fruit wasn't even good as an apple. Slightly sour, not at all sweet, and very watery. There was no taste of grape, and once sliced the aroma also was so reduced as to be a non-player. At close to $1.25 per fruit, I think I need to pass on these.